Two weeks ago, Roberto Bedoya asked several arts bloggers, including me, to write a post reflecting on Whiteness and its implications for the arts. I am in no way an expert in issues related to racial and ethnic representation in the arts. 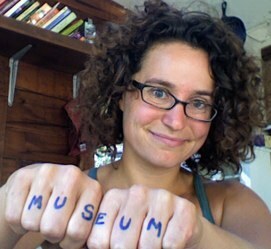 I write this piece in good faith about the organizations I know best: museums. As a feminist, when I really think about this issue, I realize that it's not solely one of Whiteness. It is one of privilege, and so for the most part, I'm going to cast it in that way. The vast majority of American museums are institutions of white privilege. They tell histories of white male conquest. They present masterpieces by white male artists and innovations by white male scientists. The popular reference point for what a museum is--a temple for contemplation--is based on a Euro-centric set of myths and implies a white set of behaviors. Other reference points for museums--as community centers, as place-based narrative vehicles, as social or performance spaces--are suspect and often branded as "unprofessional." Whiteness is in the language we use to describe the objects that we show and the programs we produce. When non-white stories are told, they are always flagged as such--an exhibition of Islamist scientific inventions or women pioneers or African-American artists. I will never forget walking through a major art institution in San Francisco and being shocked by the fact that artwork in the African and Oceanic sections was often labeled with modifiers like "beautiful,"--words intended to legitimize that only exacerbated the sense that these objects were not legitimate artworks in their own right. I never saw comparable adjectives used in the European art labels at the museum. I remember a photography exhibition in Boston where one photograph of three young ballerinas was labeled with their names. A second image, of three ballerinas with Down Syndrome, were labeled with their difference. The message, when museums produce targeted campaigns or events or exhibitions for non-white audiences is: we acknowledge you as others in our midst. Not as humans, or artists, or scientists, or dancers. As others. Whiteness is in the way professionals react to non-white projects. I wrote an angry response post two years ago to Edward Rothstein's New York Times denunciation of "identity museums" as inappropriately attention-seeking and "me"-oriented. As if every white museum is not itself an "identity museum" of the privileged, white "me." The insidious thing about privilege is the opportunity to stop using a modifier like "identity" or "white" and instead refer to your culture as canonical. Whiteness is in the behaviors we expect of our visitors, volunteers, and staff members. I recall one particularly ugly incident in St. Louis in which museum marketers required staff members to delink a signature youth program's web presence from the main site because the kids involved were "too black" for the brand image of the institution. Just last month, there was the story of the low-income family kicked out of a Paris museum for being "too smelly." Privilege sanctions white institutions to make ugly assumptions and choices at cross-purposes to their messages about diversity and inclusivity. The white privilege frame distorts the extent to which museums can represent and reflect the diversity of humanity. This distortion is not merely political or theoretical. The sad irony is that the Whiteness of museums is crippling their future--not just for multi-racial or marginalized audiences, but for everyone. When the NEA reports twenty years of declining participation in traditional arts institutions, it's not portraying a mass exodus of African-American and Latino audiences. It's talking about white people. One of the odd artifacts of white privilege is the privilege to ignore the fact that an increasing percentage of white people don't find museums relevant. The "temple for contemplation" construct is the most damaging myth about museums in existence today. It doesn't match actual visitor behavior (most people visit museums in groups and self-report that their social experience is one of the top three reasons for their enjoyment of the museum). It doesn't match visitor motivation (John Falk's extensive visitor identity research has shown that "spiritual pilgrimage" fits a small minority of visit motivations). It doesn't match arts engagement preferences for active, social experiences. And yet it looms in the popular culture, preventing would-be participants of all backgrounds from discovering the ways that a museum visit can fulfill other identity-related needs. Unsurprisingly, the museums that are bucking these trends are those that have embraced a different reference point: one of an interactive, educational, social experience. I'm talking about zoos, aquaria, science centers, and children's museums--all of which do a much better job supporting and stewarding diverse participation than traditional art, history, and science museums. These museums offer more inclusive experiences, and they reach broader audiences. The most galling artifact of white privilege in museums is expressed in their extreme reluctance to confront the reality of increasing irrelevance. Only an organization in the most privileged position could experience declining participation and argue that its relevance is increased because of its relative rarity. Only an organization suffering from extreme delusion and a healthy endowment could dismiss inclusive forms of engagement as "pandering." I have worked with white museums in majority-black cities that are neither willing nor forced to accept the fact that they are not representative of their communities. The fact that a city or state history museum could blithely disenfranchise the majority of its citizens is shocking. And it's made possible because of the privileged position of Whiteness. On the positive side, there is more data, and therefore more arsenal, to mount an argument that the position of Whiteness and privilege in traditional museums and arts institutions is unrepresentative of our entire population's interests and needs. Shifting ideas about authority, access to information, and arts participation crosses racial, socio-economic, and generational boundaries. White privilege is becoming increasingly antiquated and indefensible. On the negative side, increased efforts at inclusion have been treated primarily as add-ons and not as necessary changes to the heart of white institutions. Now, when asked about diversity, most white institutions can point to a particular program or initiatives and say, "we've got that covered." In the worst cases, demographically-targeted programs can be used as fundraising shills ("poverty pimping") to protect the white privilege machine that most of the budget fuels. The overall result is that white museums are grossly unprepared to meet the challenge of dramatic shifts in demographics and cultural engagement interests. They've added colorful patches to their garments when the whole cloth needs to change. I am a white woman. I cannot change my race or gender. What I can do is acknowledge the privileged frame which I have been granted, and try with humility and openness to relentlessly challenge and expand it. I feel this is something that we have to do both personally and institutionally to make our organizations as relevant and essential as possible.